It’s a good day when a new Star Wars featurette comes out. This latest behind the scenes video is all about the making and design of the Star Wars: Force Awakens costumes. Though brief, this clip goes into the thought process behind Rey’s outfit and what elements went into inspiring the look. This clip comes from a longer behind the scenes video called “Dressing the Galaxy”. It’s an iTunes exclusive to those who buy the digital version on the music and video streaming service. The featurette will go deeper into conceptualizing the costumes for all of the characters in Star Wars: The Force Awakens. Though we only briefly see a look into the work that went into making Rey’s outfit – which she wears pretty much the entire movie – it seems like it could be a cool exclusive for those who’d rather have a digital copy than a physical DVD. There’s no question that a lot of work goes into designing any movie, but I’d imagine it’s much harder for something as grand as Star Wars. It’s got a real iconic look, and I’m curious about the challenges that arose in creating the costumes. Michael Kaplan, the costume designer, had a tough job, but all the characters look pretty great. 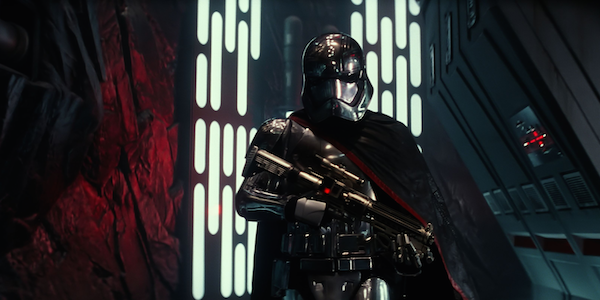 If there’s any outfit I want to know the creation process for, it’s Captain Phasma’s armor. Say what you want about her being the new Boba Fett, but he had an awesome look. Supposedly that armor is made from the melted down remains of a yacht that was once owned by Emperor Palpatine. How much of a diva do you have to be to have your armor made from a boat? There are a number of different versions of Star Wars: The Force Awakens Blu-ray’s out in stores. Every copy comes with the standard features which include a documentary about the making of the film, a featurette on the making of BB-8, the first table read with the entire cast, crafting the practical creatures of the film, and a look into John Williams new score for the film. Additionally, Walmart, Target, Disney and Best Buy each have their own special editions. Target comes with 20 minutes of exclusive special features and a special slipcase while Best Buy’s comes in a SteelBook packaging case. Disney’s edition comes with a lithograph set of the characters that you can stick to walls and Walmart’s comes with some trading disc, which seems like it’s pretty much for kids. Star Wars: The Force Awakens is out on DVD and Blu-Ray, while it’s sequel, Star Wars Episode VIII, is scheduled to arrive in theaters December 15, 2017.